At least year’s Bridges Conference in Stockholm, I attended a short presentation by Susan Goldstine about “self-diagramming lace”. As motivation for the new work she was presenting, Susan referenced her paper from the year before on what she calls “symmetry samplers”. Samplers are an old tradition in fibre arts. 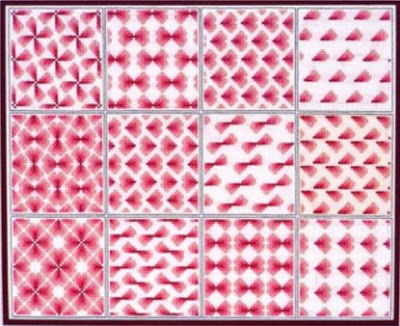 A symmetry sampler combines small swatches depicting every possible mathematical pattern type that can be realized in a given medium. If you are familiar with repeating two-dimensional patterns, you will know that there are precisely 17 distinct pattern types, known as wallpaper groups. This sampler shows only 12. But as Susan pointed out in her talk, Shephard’s piece is nevertheless a complete symmetry sampler. In cross-stitch, the stitches are applied to a woven fabric (called “aida”), which has holes for stitches arranged in a square lattice. Rectangular grids are fundamental to woven cloth, and necessarily constrain the symmetries that are achievable in cross-stitch. In particular, the square grid cannot support threefold or sixfold rotations (consider, for example, that no three points in a square lattice can form an equilateral triangle), which prohibits the five wallpaper groups that include them (for the record, they are p3, p31m, p3m1, p6, and p6m in the traditional crystallographic notation). Five mad weave polyhedral models by Paul Gailiunas, presented at Bridges 2013. A sample of mad weave with the holes illustrated on the right. With a suitable stitching pattern, those holes would permit threefold and sixfold rotational symmetries! Sitting in Susan’s talk, these two threads came together (so to speak). If I could find (or make) a suitable piece of triaxial cloth, I could use it as a kind of aida. Then I’d have to develop a new stitching pattern that’s as analogous as possible to traditional cross-stitch. 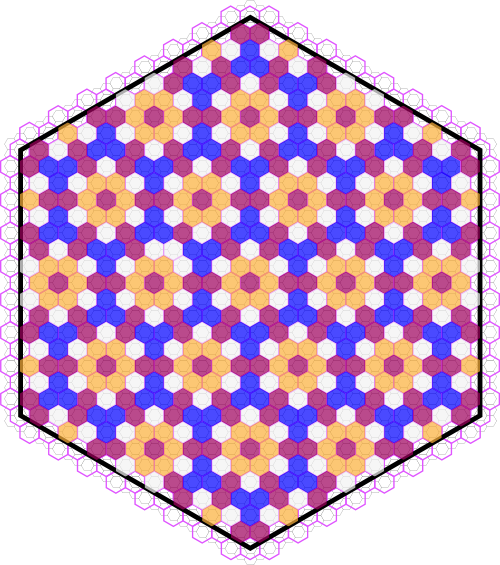 At that point, I’d be able to create a hexagonal cross-stitch symmetry sampler. I resolved to attempt this project in time for the following year’s Bridges conference. 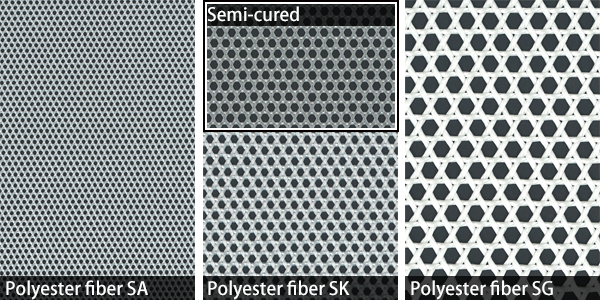 Image from Sakase Adtech’s site showing their triaxial weave. My first ever cross-stitch project. I made a bunch of mistakes in transcribing the pattern, and you should see the horrific mess in back. But it provided a suitable introduction to the medium, enough to get working on the hexagonal piece. The three steps for stitching one unit in hexagonal cross-stitch: vertical, backslash, slash. Here, three individual stitches in a prescribed order (“vertical, backslash, slash”) make up an asterisk-shaped unit. The stitches begin in the six hexagonal holes surrounding another hexagon and jump over that central hole, meaning that a number of holes have no stitches in them. That’s fine, of course, if the units are small enough, and this approach turns out to be the most convenient way to work with this fabric. 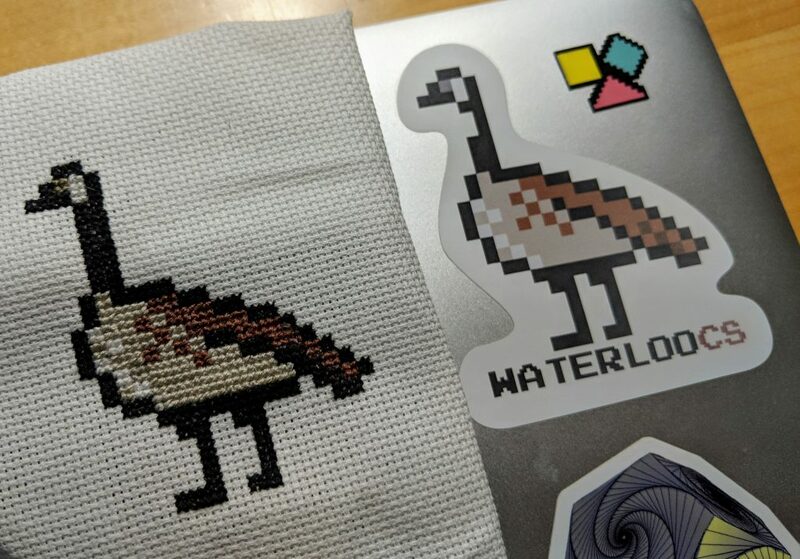 An example of a piece of hexagonal cross-stitch. Click to download a vector illustration as a PDF. A (more) complete cross-stitch symmetry sampler (2019). Click to see a full-size image. 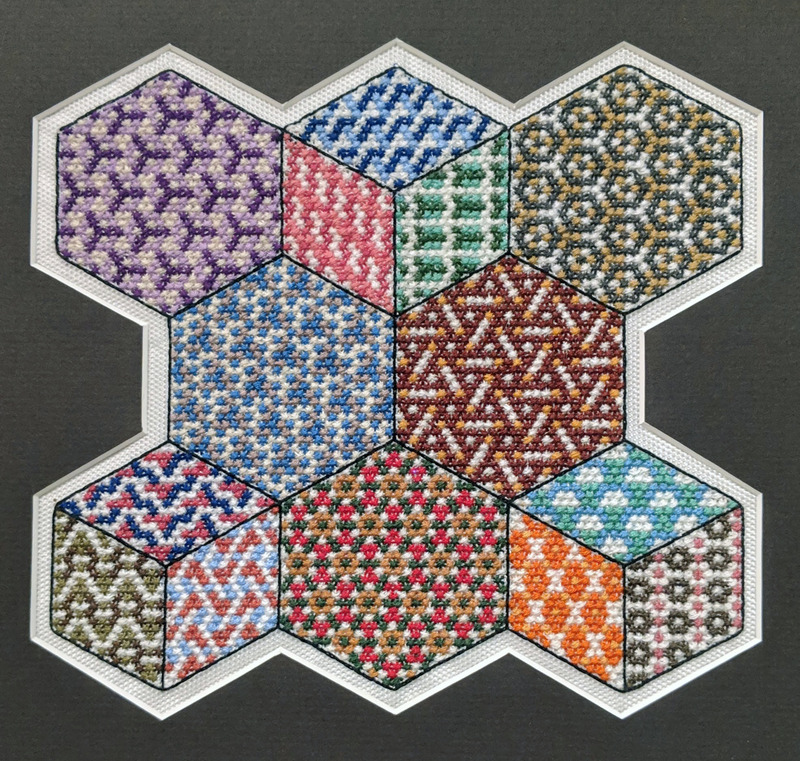 There are five large hexagonal cells, containing the five symmetry groups that are not possible using traditional cross-stitch: reading in rows from the top, p31m, p3m1, p3, p6, and p6m. The other three cells are each divided into three rhombi, showing the other nine wallpaper groups that are also possible with hexagonal holes: p1, p2, pm, pg, cm, pmg, pgg, pmm, and cmm. This fabric can’t show fourfold rotations, which leaves precisely three wallpaper groups (pm, p4g, and p4m) on the sewing room floor. That makes for a grand total of 14 groups, versus 12 for traditional cross-stitch. Take that, Mary Shephard! A pedantic mathematician will no doubt observe that the sampler doesn’t actually have all the symmetries advertised here. In each individual unit, the stitches are layered, which strictly speaking eliminates nearly all possible kinds of symmetry. Pedant, I salute you! Indeed, if you take the layering of threads into account, and require every unit to follow the vertical-backslash-slash pattern, then I think you’re able to represent only groups p1 and p2. Of course, the same layering problem arises with traditional cross stitch, and we respond with the same simplification: for the purpose of evaluating symmetry we flatten stacks of thread into conceptual blobs of colour. Very special thanks to Ryoji Sakai and Sakase Adtech for sending me samples of their triaxial fabrics, and to Teruhisa Sugimoto for providing assistance in reaching out to them. Thanks also to Veronika Irvine for providing feedback on both the mathematical and stitching sides of this project, and to Linda Carson for suggesting the oddly shaped matte, which was expertly cut by The Artstore in Waterloo. And of course, thanks to my wife Nathalie for teaching me the basics of cross-stitch, giving me access to her large stash of supplies, and not mocking my visor too much. 3 Responses to "Hexagonal Cross Stitch"
Oh wow, this is amazing.